A GOOD CAMERA DOES NOT MAKE A GOOD PHOTOGRAPHER. Think about it, a fast car doesn’t make you a professional race car driver, and a fancy set of paint brushes doesn’t make you an artist. It takes years and years of experience, time, and training to get to the level of great photographers, and that type of education, can’t be bought at Best Buy on Black Friday. But let me sell you on the idea of a wedding photographer, with a few reasons as to why you should hire someone with the expertise to document your special day accordingly. Insurance A professional photographer caries two types of insurance, liability, and equipment. This might not seem important to you, but what if your photographers camera breaks a day before your wedding, and they don’t have the funds to fix it or replace it? What happens if your photographers bag bumps into someone, and causes injury to the guests at your wedding? Certainly, hopefully things like this won’t happen, but if they do, you need to have the comfort of knowing its not providing financial or physical burden on you or your guests. Also, many wedding and reception venues require a photographer to carry some sort of insurance plan in order to be able to shoot on the premise. Professional Grade Equipment Sure, a nice camera can be purchased for a few hundred dollars these days, but does that make it professional? The consumer grade dSLRs have a shutter rated for 1/3 of the amount that most professional grade bodies are. This means, those cameras are more likely to fail under heavy use. Aside from that, lenses are often regarded as more important than the camera bodies themselves. An inexpensive lens is far less likely to focus correctly, and focus at the speed of a professional grade lens. A wedding album of out of focus photos isn’t very useful. And its worth noting, all equipment will break in time, its the very nature of the world. However, professional photographers will have backup equipment, and often, backup equipment of that. If your family friend’s camera breaks during your ceremony, he/she won’t be able to replace a camera mid-ceremony. A professional photographer will just need to walk to their camera bag, and grab a second camera body from it. These same rules apply for flashes, lenses, memory cards, batteries and so on. ALWAYS check with your photographer that they have back up plans in case of an unforeseeable failure. And unforeseeable problems don’t just happen to the photographer. Often photographers will keep backups of your photos for years after your wedding. This means, that if something such as a flood or fire was to happen to you, not all is lost. Skill and Experience Part of being a professional photographer is knowing your craft, inside and out. Everyone is capable of taking a good picture, and often they do. However, it takes a professional to take a great photo time and time again. That consistency doesn’t come from a camera, it comes from years of experience in photography. There is much more to photography than just pressing a button. An understanding of light, angles, posing, and knowledge of your equipment’s capabilities are all what make a photographer so great. The auto functions are great on modern cameras, but they’re not perfect. You need someone who has a general understanding of their surroundings and equipment to insure that perfect moment captured on camera. Another key factor to hire a Professional Photographer on your wedding day is their experience of having shot weddings before. The days leading up to your wedding may seem to drag along, but I promise you, the entire day will go by very quickly. Its a photographers job to not only capture those special moments, but also prepare for the next moment. They have experience on the off chance that something goes wrong. Whether that’s rain on your wedding day during an outdoor ceremony, or a last minute pimple on your face. They have the knowledge to assess the problem, and help move forward from it, because it’s experiences that they’ve all seen or planned for before. Dedication to You Having your uncle or friend photograph your special day might sound like a great idea on paper, however, they’re ultimately there to be at your wedding, not to take photos of it. Having someone there to photograph your wedding, that has no personal connection to you, means they’re focusing on getting the best possible shots they can for the entire day. They’re not going to want to go on break during your reception to socialize with friends and family. A professional photographer is there, the morning that you’re getting your hair and make up done, photographing it. They’re there days before the wedding, getting last minute information, leading up to your wedding day. And while its important to get to know your wedding photographer, they’re there on a professional level, to insure that professional work is done. 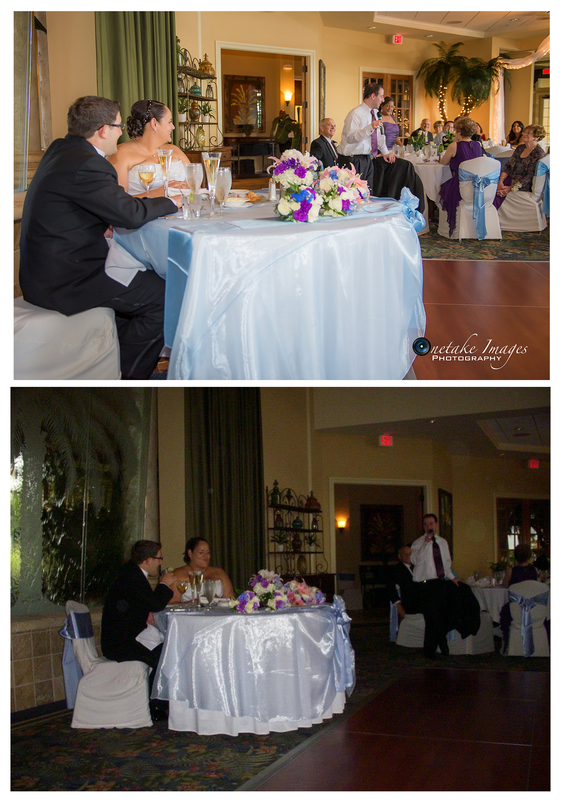 These photos were taken at about the same time, at the same wedding, with similar equipment. However, the one was taken by a professional (Onetake Images), with years of experience in photography, and the one was taken by someone who had just bought a nice camera. So there are my two cents. And certainly I’m not trying to sell myself to you (however, if you would like me to be your photographer, contact me), but rather, sell the idea of a professional photographer to you. Your wedding day often gets regarded as the most important day of your life, so you should spare no expense on someone who is there to document it for you. Please share any good or bad experiences you may have of had during your Wedding!